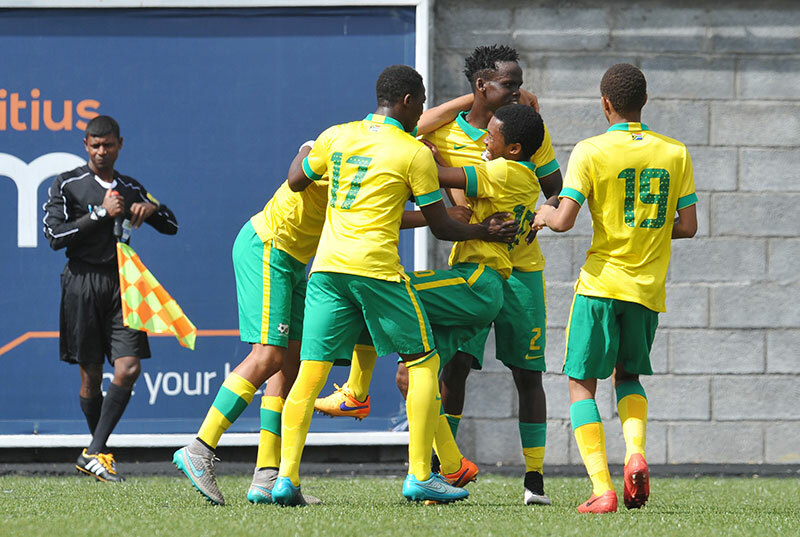 Welcome to our live coverage of the 2016 COSAFA Under-17 Championships Group A clash between South Africa and Mauritius on Wednesday. South Africa XI: Tshepo Mohui, Mswati Mavuso, Luke Fleurs, Sechaba Mokoena, Lethabo Mazibuko, Mjabulise Mkhize, Tyreese Pillay, Sabelo Radebe, Luke Le Roux, S’miso Bophela, Siphamandla Ntuli. Subs: Malesela Langa, Kwenzokuhle Shinga, Bonga Dladla, Linamandla Mchilizeli, Damolelo Radzilane, Glen Baadjies, James Monyane. Mauritius XI: Louis Begue, Jeffrey Antoine, Riano Perticot, Neehal Hurdoyal, Vashist Calcutta, Jean Aristide, James Sophie, Jean Begue, James Moothoosamy, Louis Mathurin, John Far. Subs: Christophe Louis, Emillio Perle, Jean Leon, Jeremy Iron, Stephen Catherine, Matteo Monple, Louis Gouilleram, Jean Tolbize. FULLTIME: South Africa win 2-0 against Mauritius and finish top of Group A! 89′ – Yellow card for Jeffrey Antoine of Mauritius. 84′ – Yellow cards for Emilio Perle of Mauritius and Tyres Pillay from South Africa. 74′ – PENALTY GOAL! Tyreese Pillay scores from the spot for South Africa after a foul on Bophela! 2-0! 67′ – South Africa sub: Damolelo Radzilane comes in for Bophela. 61′ – Mauritius sub: Jean Tolbize comes in for Calcutta. 61′ – South Africa subs: Bonga Dladla and Kwenzokuhle Shinga come in for Le Roux and Mazibuko. 60′ – Mauritius sub: Matteo Monple comes in for J.Begue. 59′ – Mauritius sub: Emilio Perle comes in for Sophie. 56′ – RED CARD! Goalscorer Mavuso is sent-off for South Africa, who now have 10 men! HALFTIME: South Africa lead 1-0 over Mauritius at the break through Mswati Mavuso! 44′ – GOAL! Mswati Mavuso scores for South Africa at the end of the first half! 1′ – We are under way in the match between South Africa and Mauritius!